The following is a guest post from a true glamping/camping/backglamping expert and one of the people that inspired me to write this blog- Brian Glynn. 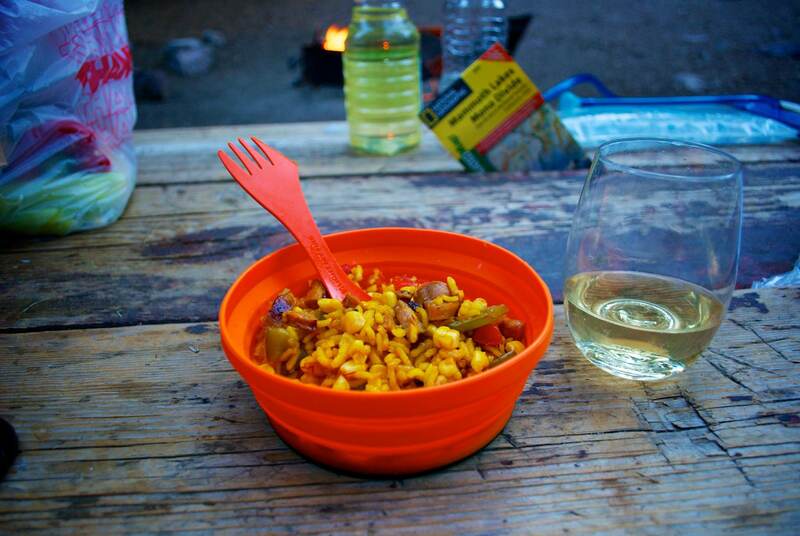 There’s absolutely nothing better than the satisfaction of making a fantastic meal while camping. Now, before you get all upset and claim that cooking and glamping don’t go together, hear me out. Eating while glamping for some could be about reheating some Pizzeria Delfina over a campfire, or hiring some one to crash your campsite and make you dinner. But for me it is about going as gourmet as possible with my own cooking skills. 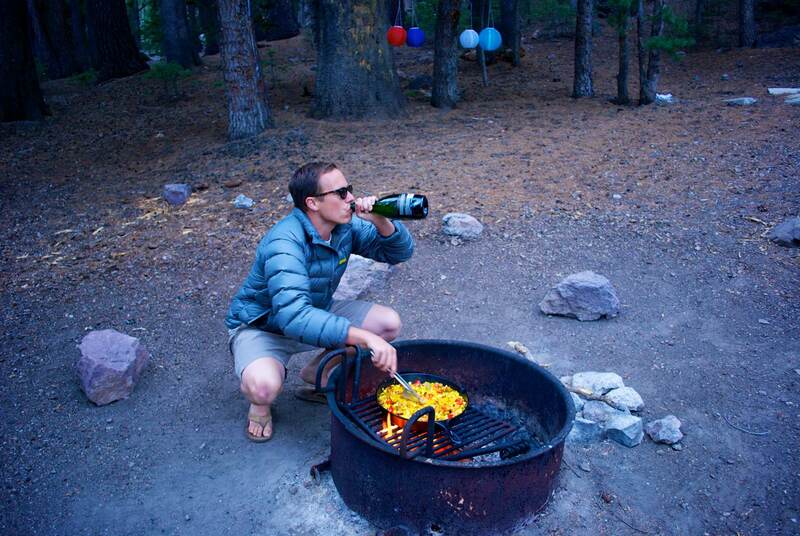 My favorite way to flex my gourmet muscles while glamping… paella. While my friend who just recently visited Barcelona tells me that Paella is only for lunch, I say hogwash, it’s fantastic all the time, especially in the woods. Paella, like pizza, is also one of those dishes that’s supper flexible. So for instance, when your vegetarian and gluten free buddies team up with their pescatarian and vegan girlfriends, paella has you covered. All you really need is rice, saffron and a hot pan. Of course, with just those ingredients it would be a boring dish, but as far as I’m concerned you’ve technically got all you need. Everything else is variable. So here’s my recommended recipe, but as true with almost all recipes, improvise and get as creative as needed. 1. Step one, get a pan. I go with a Lodge cast iron pan that’s already been seasoned. Seasoning a pan is a subject all to its own, so we’ll just leave it there for now. 2. Step two, start a fire. Or, make someone else do that, this is glamping, right? The fire needs to be positioned such that the flame will be underneath the grill. TIP: If you’re backpacking, bring along a wire cooling rack. This in combination with some well-placed rocks is a great make shift grill. 3. Next, make a cocktail. Ya, you heard me! Got to do something while the fire is getting going. Bonus Recipe: Fever-Tree Premium Ginger Beer, 1.5oz Vodka, Squeeze of half a lime. 5. Step three/four, after your fire is hot, put your pan on the grill. Position the grill to ensure it is getting sufficient heat. Next add some oil to the pan. We are looking for enough oil to coat the entire pans surface. Once the oil is hot, add your diced up onion and pepper. If you got it, throw in a pitch of salt. TIP: Multiple colored peppers makes it pretty. 6. Once the onion is semi cooked, poor in 1.5 cups of Arborio rice, which you can find at Whole Foods. We want the rice to get a little toasty, so let it toast while continuously stirring in the pan. Do this for a few minutes tops. 7. Next, add enough water to cover the rice, a little more then a pitch of saffron and your concentrated stock. Stir to combined. 8. You know how you’re shampoo says “rinse and repeat”. This step is sort of like that… we are going to add water until we taste the rice and claim it’s doneness. We don’t want rice soup, so add less and less water as it nears doneness. In this process remember to stir the rice every minute or so. When its getting close feel free to add some other bonus ingredients. I prefer some corn, pre-cooked sausage and some cooked shrimp, but this is where you get to be inventive (and dietary restrictive as needed). Anything you want to add should be pre-cooked at this point. 9. Once you’ve claimed the rice to be done. The last bonus step is to crisp up the bottom of the rice. 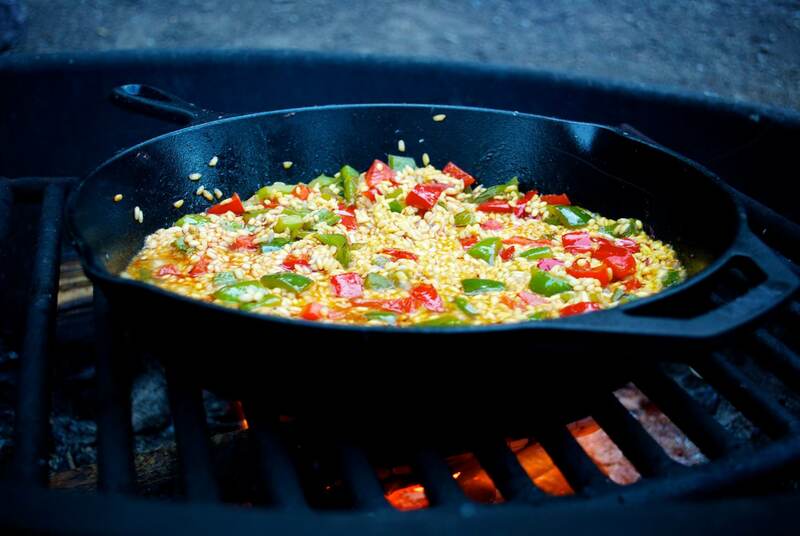 Drop the grill closer to the fire and do not stir the rice until it gets crispy and starts smelling a little toasty. You’re done! Time to bust out the GoVino flutes and toast to your awesomeness, while enjoying your tasty Paella masterpiece.